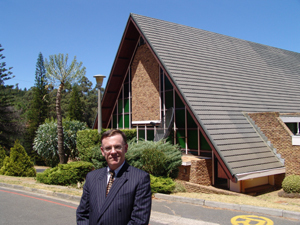 Dr. Jonathan Gallagher has just returned from presenting a 12-part series in South Africa. 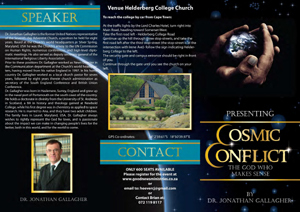 At the invitation of the Helderberg College Church, the series was held at the Church from May 27 to June 4 and entitled "Cosmic Conflict: The God Who Makes Sense" centering on the universe-wide conflict over God's nature and character. 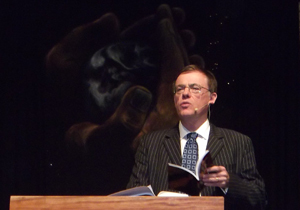 To accompany the series a 100-page book The God Who Makes Sense was produced locally as a way of providing additional material to support the main theme. 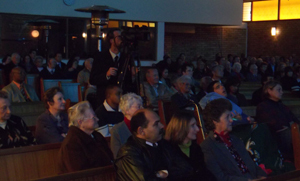 The series covered many aspects of "God ideas" and was presented in a seminar format that allowed much audience participation and feedback. 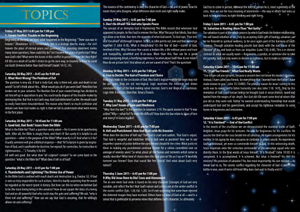 "The Questions and Answers period was very dynamic," comments Dr. Gallagher, "and on the last night I noticed on the screen that it had been changed to 'Questions and Questions' reflecting the comment made by some that even the answers provoked more questions. That's how it is when we start thinking deeply, and I greatly appreciated the opportunity to approach belief in a way that invites the questions that people are asking today." Topics included the problem of evil, the concept of hell, divine use of power, problem Bible texts, freewill and predestination, law and legalism, the meaning of the Cross, salvation as healing, the friendship model, and the conclusion of the cosmic conflict. The whole series was videoed and a set of DVDs is in preparation. It is also hoped that the book The God Who Makes Sense will be reprinted for wider distribution. "I'm so grateful for the opportunity provided by the Church and its leadership to examine in much greater depth the God who makes such good sense and who invites us into a saving, healing relationship with him," says Dr. Gallagher. "It speaks well of the Church as it seeks to share the vital good news of God with those around us." Invitations were sent to many in the local community and some took the time to attend and discuss the issues raised. "I pray that this event will have a long-lasting impact and help many to trust in the God who is truly worth trusting," Dr. Gallagher concludes.